If you have an existing DREMC electric pole on your property, you can rent a security light from DREMC for just pennies a day! DREMC offers three basic high-pressure sodium (HPS) security lights: 100-watt, 250-watt and 400-watt. Typically, homeowners choose the 100-watt HPS light to illuminate yards and driveways. 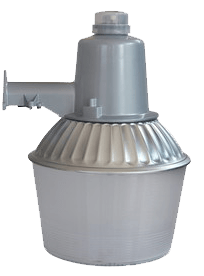 The 250-watt HPS light is perfect for street lighting and offers a greater distance of property illumination than the 100-watt. The 400-watt security light is used mostly for commercial locations like businesses, warehouses, parking lots, etc. The monthly cost of each security light varies slightly from month to month as the TVA fuel cost is adjusted but only by a few cents. The rental fee is added each month to your DREMC electric bill for convenience. For more information about having a security light installed on your electric pole through our rental program, please call your local DREMC district office.